Sometimes we receive welcome snippets of history by e-mail, and the following is a delightful example from Summer 2010. It has been edited slightly. "I am e-mailing you on behalf of my mother Mrs Elizabeth Reynolds née Applin, who was married from Arborfield Hall in 1951." In a later e-mail, Jacki Reynolds said: "Unfortunately, neither myself nor my mother live near Arborfield. Mom and her sister Rose originated from Aldershot, and Rose went on to live in Reading after her marriage, and mom spent most of her time there. When mom married, it was to a "Brummie" and she settled in Birmingham. I am not sure if she has any pictures of the Nissen Huts; she did have a picture of the cows in the river, a similar picture to the one in the gallery on your site but cannot find it at present." Needless to say, we would love to see photos of the Nissen Huts in the grounds of Arborfield Hall. 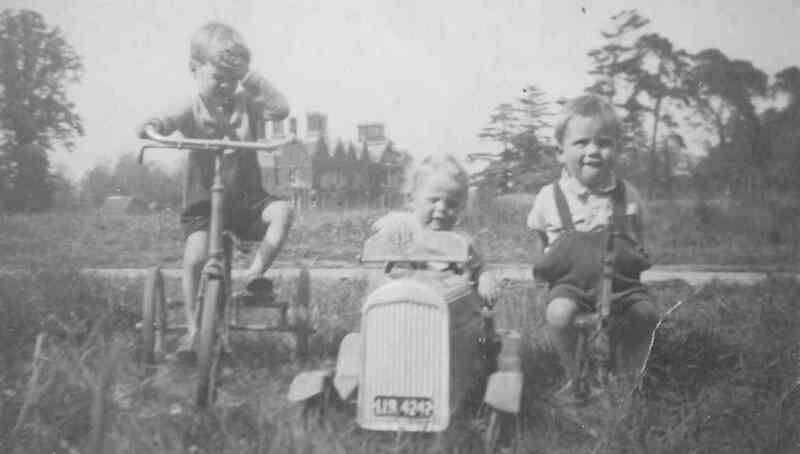 They were temporary homes to dozens of families in the late 1940s and early 1950s. 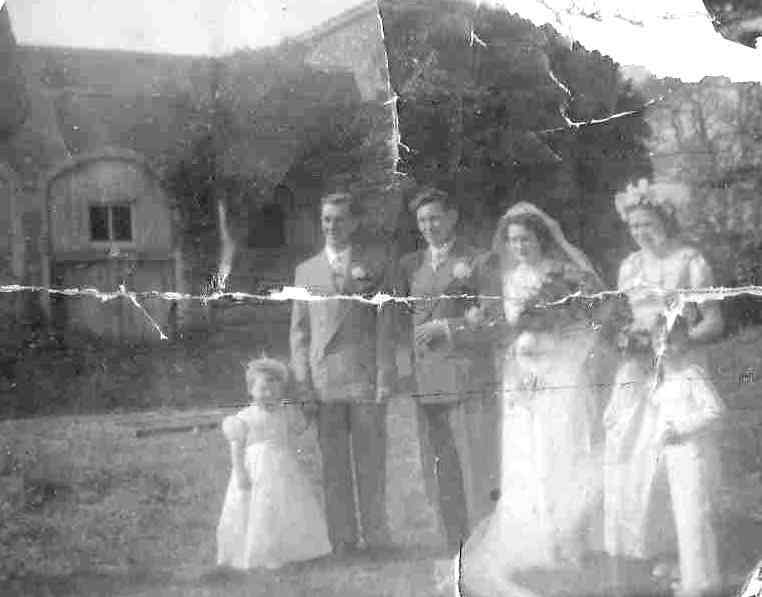 Her sister and brother-in-law Bob and Rose Davis (no relation to the Davis family in your article) moved into a Nissen Hut around 1949 and stayed there for 6 to 12 months before moving into the 1st floor flat in Arborfield Hall with their first three children Patrick (Paddy), Robin (deceased) and Kevin; their fourth child Sean was born there in 1951. Paddy played quite frequently with Esme Hiscock, the little girl in your article who had the tragic accident. The flat took up the majority of the first floor with the exception of a few rooms that were in disrepair. There was a lounge, kitchen, bathroom, two large bedrooms and another smaller bedroom. Below them in the ground floor flat lived Sammy and Bella Watton. The Muir family in your article owned the local dairy. They were guests at my parent’s wedding and reception which took place at The Magpie and Parrot public house. Some of the main wedding party, including my mother and father, were given a lift back from the reception in the dairy van. 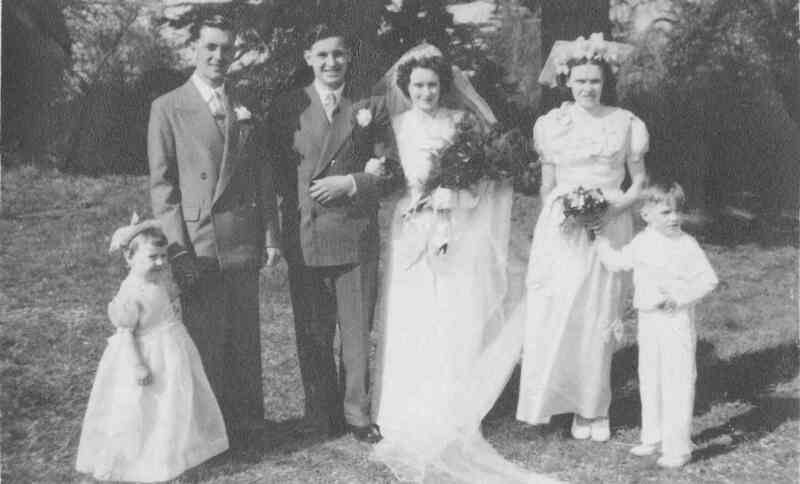 From the marriage certificate, we learn that the wedding took place at the Catholic Church of Christ the King in Cressingham Road, Reading, on 21st April 1951. Both Ronald Frederick Reynolds and Elizabeth Mary Applin were 24; he was a Scaffolder and she was a Stores Record Clerk. Both were living at the Arborfield Hall camp at the time. Ronald’s father Alfred Frederick Reynolds was a Foreman Stamper at an engraver’s, while Albert Ebenezer Applin was a Timekeeper for the Court Service. 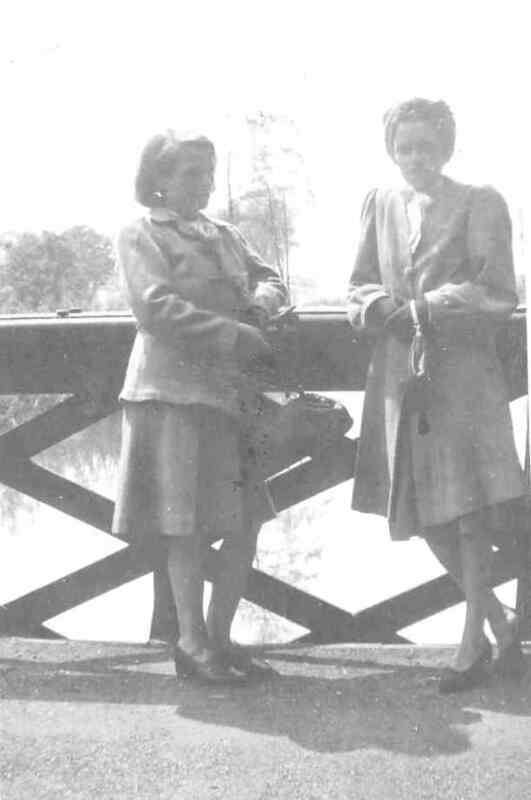 Elizabeth’s sister Rose Davis was one of the witnesses. The Registrar was the aptly-named William Joseph Church. The Hargreaves family purchased the Arborfield Hall estate, 5 miles from the county town of Reading and 3 miles from the Hampshire border village of Eversley where Charles Kingsley, author of ‘The Water Babies’ is buried in the old parish church. 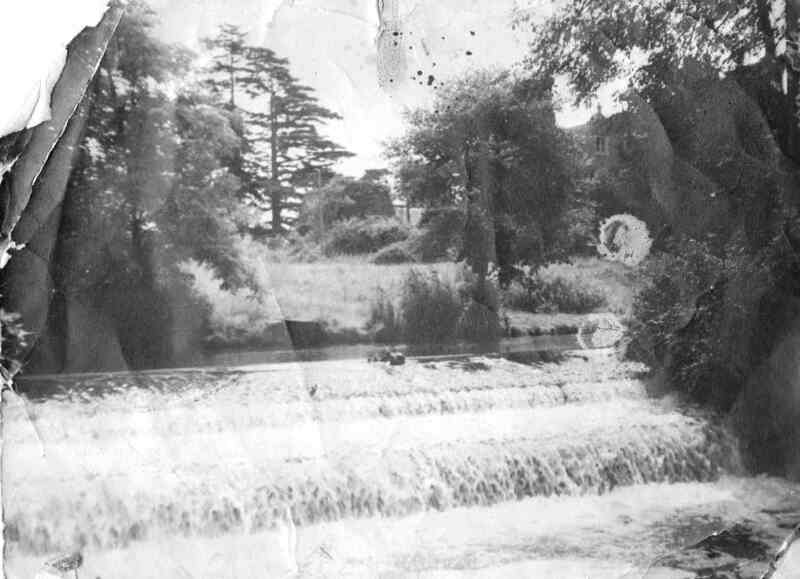 Running through their land was the River Loddon: beautiful in the summer, but prone to flooding in the winter. 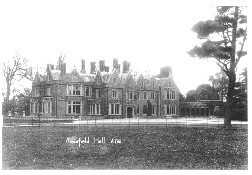 Their house, Arborfield Hall, stood tall and imposing surrounded by a long semi-circular drive with a lodge house at each entrance. Arborfield Hall boasted a magnificent ballroom with a high vaulted ceiling. The entrance to the Hall was a wide white portico leading to a spacious hall. The eye was drawn to the wide sweeping staircase leading to the first floor; at the bend of the staircase there were two full length stained glass windows and in later years the names of all the previous owners were printed on each small section; these names could also be found in the old chapel. Sadly, these windows were replaced with plain glass over the years due to damage. Either side of the windows stood two full length mirrors. The staircase led up to a long picture gallery running almost the full length of the house. Rooms and passageways led off this gallery. To the far end, a grilled door led to a spiral staircase, which came up from the basement kitchen and in turn led to the servants’ quarters on the upper floor. This was still in place when the first floor was converted into the flat. This floor consisted of many, many rooms or cubicles which in turn led up to the turreted roof and bell tower. The ballroom and several of the downstairs rooms led out to the paved courtyard and from there a big lawn sloped downwards towards the River Loddon, where a narrow path led right to the stables and to their own private chapel. It passed the gardeners’ small building and arrived at a high walled opening, which led to the chapel. The wall was covered in purple wisteria and the bushes and shrubs had been allowed to grow over the path making it difficult at times to negotiate, especially when the weather turned wet and the path became very slippery. The pathway to the left of the house was a tree lined winding path which veered away from the river and then returned to follow the water until it reached the main road and the chief bridge. There are three bridges in all; two smaller bridges covering small tributaries of the Loddon. 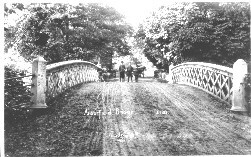 Legend has it that the ‘Three Bridges’ area is haunted by the g host of a dishonest butler, who committed suicide by jumping off the main bridge and drowning in the flooded river. The tragic circumstances of the butler’s death happened in the early 18th century, but more tragedy was to come that would alter the atmosphere of the ‘big house’. 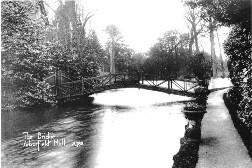 Late into the 18th century, a young serving maid, wishing to marry her childhood sweetheart who lived in nearby Arborfield, sought permission from her employer, the then squire. It was the custom in those days for the servants to marry within the household staff. The servant was heartbroken when not only was permission denied but she was then informed that she was to marry a young footman. The marriage plans were brought forward to take place in their private chapel on the next Saturday. Devastated, the young maid got word to her former lover telling him that she could not marry him, and would never be able to see him again. There was no way out for her as there was no work anywhere else; her family depended on her meagre wage, and her boyfriend could only get casual work on the farms. Saturday came and she exchanged vows with this person whom she did not love or like. Her fellow servants could hardly hear her responses as tears spilled down her face onto her Sunday best dress. The wedding over, the bride and groom began walking back; making their way along the narrow river path leading to the back of the house (the kitchens were underground and could only be entered by the steps of the ‘area’ as it was called). Suddenly, a dreadful high pitched scream rang out followed by shouting and cursing. The servants hurried to the scene. The ghastly spectacle that greeted them was the most terrifying, sickening disaster. The body of the bride lay grotesquely dangling over a yellow gorse bush, by now stained with blood gushing from a gaping gash in her throat. The body of her lover laid half in and half out of the water with a knife protruding from his chest. The young bridegroom was crouched on the path babbling incoherently one minute and screaming the next. In the turmoil that followed one more person died of shock, and one more ended up in the ‘mad house’ as it was known in those days. The legend goes that the bride’s body was placed before her burial in the gardener’s hut, which henceforth was always referred to as Millie’s Morgue. It is said that on each anniversary of her death she can be seen coming from the morgue and walking the path along the river bank. But she has also been seen by many people floating through the house. 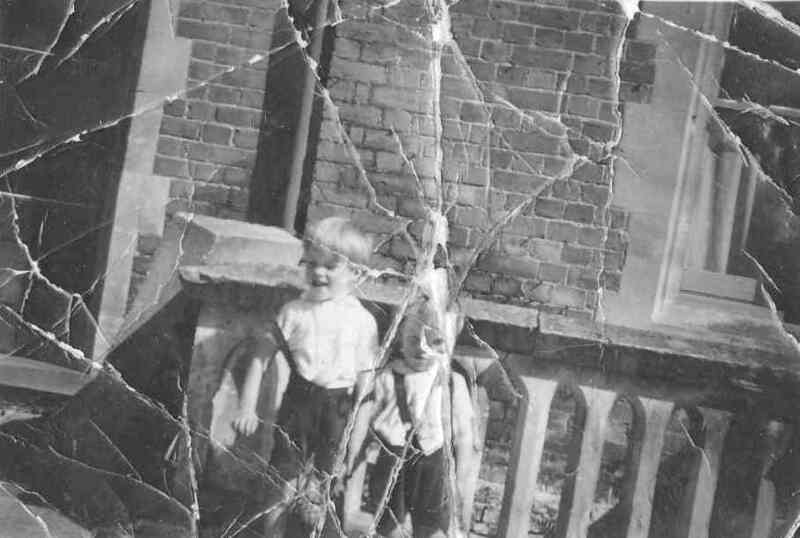 With grateful thanks to Jacki Reynolds and her mother for a fascinating insight into life at Arborfield Hall in 1949-1950, and for the large photographs that illustrate this article.